See, one of the reasons I introduced the secondary reads is to catch up on series if a later book won the Hugo Award. I’d always intended that these secondary reads may occasionally involve catching up on series for a nominated book. But…what’s one to do when book 14 or 15 of a series is nominated? That’s what happened when Captain Vorpatril’s Alliance was announced as one of the nominees. It’s the 15th novel released in the massively epic Vorkosigan Saga, and slots in as the 14th novel in the current continuity. These novels start showing up in the read in 2018, but I didn’t expect one to show up in the nominees. I’m going to slot it in with no prereading. There’s nothing else I really can do. I may then skip it myself, even though that’s somewhat against the spirit of the Great Hugo Read, and catch up in December of 2021 if it wins. There’s another book on the nominees list that’s part of a series, but a much shorter one. I am going to slot the two previous books in that series as secondary reads. So here goes, one schedule, five months, seven books. Print: Recently released in paperback. Electronic: Available DRM-free. Kindle, Nook, iBooks, Sony Reader. Audio: Narrated by Wil Wheaton, available from Audible and iTunes. Print: Available new in paperback. Electronic: Available from Kindle, Nook, iBooks, Sony Reader. Audio: Narrated by Paula Christensen and Jesse Bernstein, available from Audible and iTunes. Audio: Narrated by Paul Gigante, available from Audible and iTunes. Print: Available new in hardback, paperback released in September. Electronic: Available from Kindle only. Audio: Narrated by Grover Gardner, available from Audible and iTunes. Audio: Narrated By Chris Patton and Nell Geisslinger, available from Audible and iTunes. Audio: Narrated by Sarah Zimmerman, available from Audible and iTunes. Audio: Narrated By Paula Christensen and Michael Goldstrom, available from Audible and iTunes. The reason for the “or” there is my desire to keep books out of secondary slots during April-August to keep room for potential prereads for that year’s nominations. So if The Winds of Winter comes out in 2014 and is nominated in 2015 we’ll read A Dance With Dragons in May of that year and The Winds of Winter in July or August. Else, we’ll wait until October. That’s all I’ve got. This weekend we’ll settle on a schedule for the next five months. Then I’ll actually have some non-GHR related posts so that this doesn’t take over the blog entirely. Here’s the gist of the story. Lawrence Smith, aka Lorenzo Smythe, aka The Great Lorenzo is an actor. At the front of the book he’s approached about a mysterious gig that promises to pay him whatever he might ask. He learns he’s been brought on board to serve as a stand-in for a human politician on Mars named Bonforte, the Opposition Leader in British terms, kidnapped on the eve of being inducted as an honorary Martian. At a very high level it’s the plot of the political romance Dave, but transposed to Mars. I’m not going to break down the plot, these posts are largely intended for people who have read the book. Instead, I’d like to take a few paragraphs to discuss my general dissatisfaction with the book. Don’t get me wrong, I liked the book better than I liked The Forever Machine, but that’s a low bar to clear. I didn’t like it nearly as much as The Demolished Man, but that’s an extremely high bar to clear. The question is…where in that rather broad spectrum does the book fall? Let’s start with my lesser issue with the book before moving on to my chief gripe. Lesser issue: the character of Penny. She’s probably the most realized female character of the Hugo books thus far, but…damn, I need a better cliché than how high bars are to clear. Demolished Man had several secondary female characters, but most of them served for just one or two scenes. The Forever Machine features its techno-magically de-aged female character. Double Star’s main female character, only female character, is Penny. She’s opposition leader Bonforte’s girl Friday with very clear romantic feelings for her boss. This follows a pattern in Heinlein novels of younger female characters in love with men of authority. 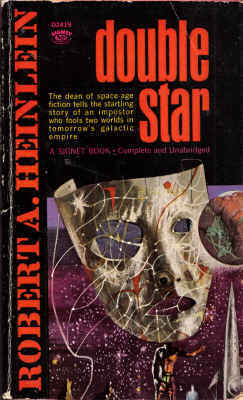 It’s certainly not a quirk only of Heinlein, or even only of fiction. Power is a fine aphrodisiac. It’s certainly not daughters begging their father to impregnate them, a plot point of Farnham’s Freehold. Is is a pattern I’ve seen in the few Heinlein books I’ve read, and a pattern I’m going to keep an eye on as we read a lot more Heinlein as part of the Hugo Read. My broader problem with Penny is not this power aphrodisiac issue. It’s that we’re told at several points in the novel that she is a very capable administrator, has advanced degrees, and even a spot in the shadow cabinet maintained by Bonforte. However, her job when on camera is to faint, cry, and be generally comforted by Lorenzo. Who falls rapidly in love with her, and the male in power falling in love with his female underling is no less troubling of a trope.Alright, a book from the 1950s has some less than ideal gender politics and poorly realized female characters. While I don’t entirely want to excuse Double Star as just a product of its time, it’s also harder to hold it to a modern standard. So let’s leave Penny behind and sit down with my broader issue with the novel: Where’s the drama? There are two potentials for conflict. Both of them lie with Lorenzo. Which is appropriate, as he’s the first person narrator of the novel. Conflict one: does he take the job and does he continue with it when it becomes clear he’ll be taking on the role of Bonforte longer and longer. Conflict two: will anyone figure him out? Conflict one is appropriately handled. There’s a thin line walked by a first person narrator when he is exploring his own motivations for acting. Consider it too little and the character feels dragged around on a leash. Consider it too much and the character becomes wishy-washy and spends too much of the novel navel gazing. Double Star perhaps leans a little towards the Lorenzo-on-a-leash possibility, but at each point that the character is asked to re-up his commitment to doubling Bonforte, he does spend some time considering the possibilities. This worked. However, it’s not a conflict source that can carry an entire book. Did I mention the emperor is a huge fan of Lorenzo’s? No? Because of course he is. Conflict two. Ah. Here’s the real problem. There is a frequently mentioned dread that someone may figure out that Lorenzo isn’t Bonforte, and that the whole charade will crumble to pieces. This conflict comes to a head exactly twice in the novel. In the first instance he’s sniffed out by the constitutional monarch of the human empire. Lorenzo screws up a shibboleth by not knowing how formal or informal to act with the emperor in private. The upshot of this? The emperor agrees with the need for a stand-in and sends him about his way. The second instance is late in the book when one of the insiders of the scheme is left without a position when the new government is drawn up, and chooses to expose Lorenzo during a meeting. The upshot of this? Learning that the conspiracy had long ago replaced Bonforte’s biometrics on file with Lorenzo’s. Glad that worked out so easily. The problem is…I don’t want things to work out so easily within the fiction I read. I don’t want the emperor to figure out what’s going on then be fine with it. I don’t want half a chapter’s worry that the gig is up just to find out everything was fixed off-screen weeks before. There’s some political intrigue, most of which goes on in spite of Lorenzo, not because of it. And…that’s perhaps the biggest problem with the book. A lot of it goes on in spite of Lorenzo, not because of him. His job is to make various speeches. His job isn’t the high stakes rescue of Bonforte. Or, with only minor exception, crafting political machinations. He is, at least, a character with opinions about what’s going on around him, and even an evolving viewpoint on the politics of the man he is meant to stand in for. I don’t need car chases (there actually is on), gunfights, or giant space battles. I just wish…there had been maybe a little more for him to do to balance out the number of things he had to think about. That wraps up the first three months of the Great Hugo Read. Three months down, 105 to go. The past winners are going on hiatus for a few months to be replaced by the 2013 nominees, which will be announced this Saturday, March 30th, at 4pm eastern time. Check out the Hugo blog for details about how to watch the nominee announcement live. I’ll get a post up by no later than Sunday night with a recommended order for the nominees. For those only interested in the catch-up read, we’ll get back to that in September when we read Fritz Leiber’s The Big Time with a secondary read, Brian Aldiss’s Non-Stop. For those interested in the secondary reads, I’ll have an announcement in about a week with some books being added to that schedule, including a complete read of all five nominees from 1966 in the second half of next year, and where I end up slipping the first five books of the Song of Ice and Fire into the schedule. So here’s the deal. I’m working on a new project and I want to make sure at least some of the details have actual technical grounding. I’m okay with a little handwavium, it’s probably unavoidable, but I want to at least have some grounding in reality. Problem is, I’m not all that great at actual technical grounding, as the last physics class I took was non-AP physics in high school where I barely got a B. So I might occasionally make these posts, I might make just this one, in an attempt to crowdsource some of my equations. The questions I have are whether I’ve got the right equations, and whether I’m using them correctly, and to also play around with LaTeX a little. But mostly the first two things. Which is equivalent to half gravity. My next trick will be to find a formula that describes the rate of descent for a body falling through linearly increasing gravity. That’s less likely to come up in-story, but more for my own curiosity. Edit: Some further poking around (which, I’m ashamed to say, has mostly been at Wikipedia so far) suggests that 2rpm is about the maximum rotation that most humans can adjust to with no ill effects, so my rotation of nearly 1/6 that rate is shockingly safe in and of itself. So that’s good to know. Now if only it didn’t have a “citation needed” tag. World Building Question: When is Noon? To start answering this question, I’m going to take the computer programming route and define some terms first. This is important because people tend to think of “noon” and “12pm” as synonyms, but for the purpose of this post they are not. I will try my damnedest to be consistent. Noon shall be defined as the time that the sun is at its zenith for the day in a given location. This is also called “solar noon,” but I’m going to simplify the term for this post. 12pm shall be defined as when a clock at a given location, set to that location’s time zone, reads 12pm. Let’s continue now, shall we? I brought up noon in my previous world building question that provided a brief history of the length of an hour, listed it as one of those clear delineating points of the day for a culture that uses the sun as its primary time telling device. Oh, that’s not to say it’s perfectly clear the exact moment that the sun is as high in the sky as it’s going to get, no big bright flash or bells going off, nothing like that. But it’s generally clear that, hey, the sun is pretty close to overhead. Now, as to what time that was? Well, there was some disagreement on that. In modern cultures, with the 24 hour clock we’ve globally settled on, it’s close-ish to the middle of the day (more on that later). In several older cultures, this was true as well. Each new day started at sun-up and went until just before sun-up the following day. Of course, under this notion, noon would be about 6 hours into a 24 hour day. Some cultures considered the new day as starting at noon, so it would be 0 hours into the day. Some cultures counted a new day when the sun set, making noon about 18 hours into the day. These don’t make any actual difference, because things were getting done during the day, and all three ways of counting would agree on what day it is. Today we count new days at midnight so noon happens 12 hours into the day at 12pm. Right? For a time, yes. For a time when the sun was at its highest point of the day where you were it was 12pm, and twelve hours later would be midnight and the start of the new day. This held on for quite a while. Every city would have its own little mini time zone. In Boston it would be 8 minutes earlier than it was in New York, give or take. When it takes several days to get between cities, little differences of a few minutes in time don’t make a hell of a lot of difference. However when the railroad came around, that’s what things started to change. Which means we’re talking 19th century. Mid to late 19th century at that. What was called “railroad time” showed up in England around 1847 and in the United States in the 1880s. This evolved into the time zones we’re aware of today. So what time is noon? Well, since an entire 1/24 slice of the globe is now on the same time, it can vary by an hour from one edge of a time zone to another. Except that time zones aren’t straight lines, they have bulges and juts that can create a wider gap than one hour. China, notably, has a single time zone that results in a four hour difference in when noon happens from the western extreme of the country to the eastern. Then there’s Daylight Saving Time that throws everything off by another hour. So to answer the question of when noon is. Today, March 21, 2013, noon in Washington DC will happen at 1:15pm. In Nashville, Tennessee and Amarillo, Texas, both in the same time zone, noon today will happen at 12:54pm and 1:54pm respectively. That’s a nearly two hour difference between 12pm and noon in west Texas. In Harbin, China, noon will come at 11:40am. In Kashgar, China, 3:03pm. The Kaliningrad Oblast, that little chunk of Russia that’s divorced from the main body of the country, uses the same time zone as St. Petersburg and Moscow. So while the city of Kaliningrad is almost due north of Warsaw, the former will hit noon at 1:45pm, the latter at 11:43am. Then there’s Zulu Time, aka UTC. Whatever you want to call it, the universal international time zone based around the non-DST adjusted time in Greenwich, UK (for various reasons that boil down to “because an Englishman figured out longitude at sea”) is where noon and 1200 hours are completely and forever divorced. Find the right place and noon will be at 0000 hours, or 12am. This is essential for organizations, like the US Navy, that need to coordinate on an international scale on vessels that might rapidly traverse time zones. So when is noon? It depends on whether you’re on the western or eastern edge of your time zone. Whether you’re in a state or country currently observing Daylight Saving Time. Whether you’re in a culture that depends on rapid transit. Whether you’re in a culture that needs/values uniformity of time for various transactions. Whether you’re observing a globally constant time. Noon as 12pm served humanity very well for an extremely long time. Now we’re moving increasingly into a society where the day is less defined as the sun and more defined as what we want it to be. So what does that say about us as a global culture? What would it say about a global culture (either alien or future earth) that fully used UTC? What would it say of a culture that reached a similar technology as earth now has without any form of time zones or universal time, letting each city have its own slightly different time? World Building Question: How Long is an Hour? Has anyone else been thinking about the nature of time lately? Two weekends ago we lost an hour, an entire hour, as Daylight Savings Time began. Today is the vernal equinox, the transition point where days are once again longer than nights. I know I must think about time around this point of the year, because it was almost exactly a year ago that I started asking these World Building Questions, and started by asking What Time Is It? I’m going to move back to my questions about how time works on earth. So we lost an hour recently, but what is an hour? Cesium. For all your time telling needs. Can you see it performing hyperfine level transitions? Alright, that’s an easy one. An hour is sixty minutes long. Each of those minutes is sixty seconds long. So an hour is 3600 seconds long. We know the length of a second because it was defined at the 13th General Conference on Weights and Measures, an occasional meeting that sets things like the international standards for metric measurements, and just how many yoctometers are in a yottameter (a hell of a lot). A second, per this SI definition, is “the duration of 9,192,631,770 periods of the radiation corresponding to the transition between the two hyperfine levels of the ground state of the [cesium] 133 atom.” Whipping out a calculator to do the math, an hour is thus 33,093,474,372,000 of…whatever the hell they’re talking about with transitions and hyperfine levels. I was never that great at the applied sciences. As I’ll one day demonstrate when I crowd source some physics questions for an upcoming novel. This is clearly a modern definition. An extremely modern definition. A definition less than 50 years old with a clarification less than 25 years old that “[t]his definition refers to a [cesium] atom at rest at a temperature of 0 K.” Cesium itself wasn’t discovered until 1860. And yet the human race has had hours for far longer than this definition has been around. For most of the history of the hour it was defined as 1/24 of a day-night cycle. Actually, this is a subtle lie. For much of the history of the hour, it was defined as 1/12 of the period between sunup and sundown. The period between sundown and sunup didn’t get hours because no one was doing anything during them, so who the hell needed to know what time it was? Night was divided, if at all, into watches. As a side note: back in that post I said “Once a society becomes more advanced, it needs more granular time,” without really going much into it. I’m not really proud of that statement, as my wanderings through history in the last year have smacked down notions of societies as more or less “advanced,” which is really a modern ethnographic concept. To employ better phrasing, the use of granulated time, which flows from broad chunks of the day to hours to half and quarter hours, relates less to the “advancement” of society as it is to the ability to easily know what time it is while on the go. If you’re bustling around Rome and not stopping to check the nearest sundial, all that matters are the periods before noon, noon itself, and after noon. When you stop at a sundial, you could see where the shadow fell and know more broadly what time it was, but the same could be gauged by looking overhead. It’s not until clocks are visible from multiple points in the city, and the advent of portable clocks we call “watches,” that the person on the go could quickly have a better notion of the actual time. So, alright, an hour is 1/12 of the time from sunup to sundown. This was thanks to those sundials, which started working every morning when a shadow first appeared and stopped working every night when the last shadows slipped into total darkness. There’s a problem with this definition, however. The period from sunup to sundown is not a constant. Here in the DC area the winter solstice produces just 9 hours and 26 minutes (by modern reckoning using the cesium atom) of sunlight. During the summer solstice DC gets 14 hours and 54 minutes (cesium) of sun. Dividing each of those by twelve, the length of a classical hour here in DC would be 47.2 modern minutes on the winter solstice, 74.5 minutes on the summer solstice. This is a significant swing. Playing this out over a modern eight “hour” work day, this would mean working just 377 minutes in late December but 596 minutes during late June. Which is why it’s fitting to talk about this today, one of the two equinoxes, when the modern definition of an hour is as close to the classical definition as it gets during the year. Actually, this isn’t quite right as most of the world is today experiencing a day of 727 minutes, not 720, but it’s as good as you’re going to get. This is less the day where we get equal amounts of day and night, and more the day that everyone gets an equal amount of day. Later hours were defined not as 1/12 of the daylight, but as 1/24 of the period from sunup to sunup. This wouldn’t result in 45 minute swings in time seen by the old definition of an hour but would still drift ever so slightly and require clocks to be reset a little each morning. Using DC from March 20, 2013 to March 21 as an example, on the 20th the sun rose at 7:11, on the 21st it will rise at 7:10, resulting in a day that is a minute short, and hours that are each about 2.5 seconds off. Which doesn’t sound like much, until you turn that into 22,981,579,425 of the cesium things. So when did hours become equal in length? Not until the 1400s. Why? It took that long for the combination of accurate time keeping and a willingness to move away from the previous sunup-to-sunup definition. Technology fighting the momentum of “that’s how we’ve always done it,” just as it will throughout human history on oh so many issues. This technology continues to push forward, and we now understand that what we once defined as an hour isn’t necessarily a constant. But I’d rather not get into that, because I’m far more likely to say something entirely wrong. Or more wrong than the wrong things I’m sure already litter this post. I like to bring these posts back to world building, so let’s give it a shot. We’ve seen how the hour evolved on earth, and how it was originally tracked thanks to sundials. The sundial is an intuitive piece of technology, by which I mean it emerged independently at several points in human history. So let’s take it out of the picture. How does time keeping evolve on a planet where the light is diffuse, say through a constant cloud layer? There would be a clear morning and dusk as light grew and diminished in intensity, midday could be intuited as the midway point between the two, but no clear progress of shadows would be seen. How would hours be divided by a species who has a sleep cycle that doesn’t line up with the planet’s day/night cycle? Would two clocks develop? What if a culture developed under more extreme cycles, such as those seen in Iceland where the length of a day swings from 21 hours to 3 hours? There’s one more bit I wanted to go into, but I’m already over 1200 words so I’ll hopefully get to it later in the week. It’s the related, but interesting question: What time is noon? 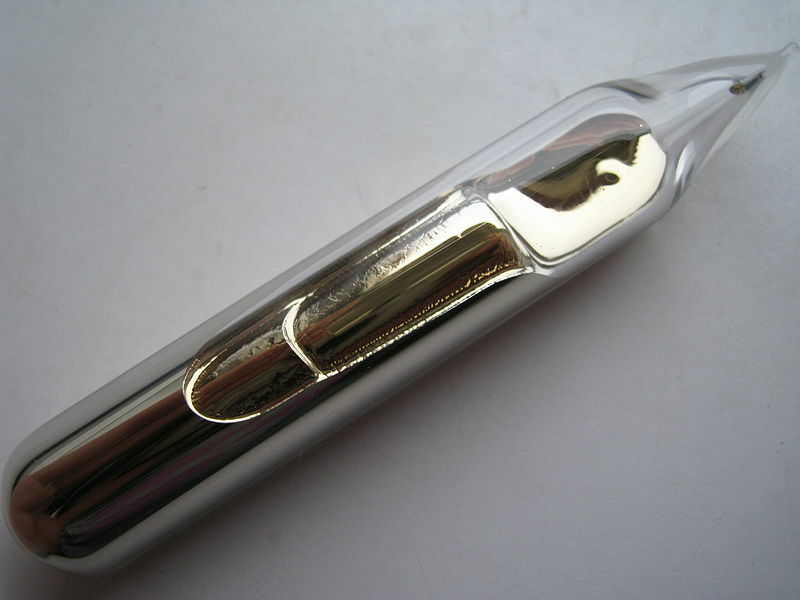 Cesium ampule picture released under Creative Commons Attribution-Share Alike 3.0 Unported license by the Dennis s.k collection. Find his other photos at his Wikipedia user page. 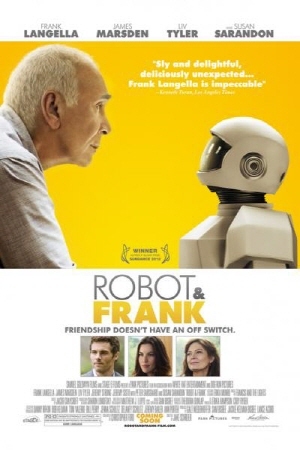 Set an unspecified number of years in the future, Robot & Frank combines two elements that I wouldn’t expect in the same movie. Frank Langella and a robot. Wait, no, I meant science fiction used as a lens for looking at dementia. It focuses on an elderly cat burglar who is slowly losing his grip with reality and reduced to pocketing soap cats at the local store, and the robot his son buys him to keep him company and exercise both his mind and his body. It’s a sweet movie, focused much more on the nature of aging than on being science fiction. The script, through Frank Langella, captures dementia with a heart breaking realism. Solid 7/10, and I’d recommend it, but avoid seeing the trailer if you can as it’s about 95% of the plot. It feels odd to come out of a movie like Robot & Frank and say it reminds me of a line from Plan 9 from Outer Space. But…well, there you have it. Specifically Criswell’s awkwardly written monologue at the beginning: “We are all interested in the future, for that is where you and I are going to spend the rest of our lives.” The movie comes down to an elderly man coming to grips with spending the rest of his life in the future. The library he walks to daily is being digitized. His new companion is a robot. The world is changing around him, as it will change around all of us as we get older. This is, perhaps, getting a little philosophical about the nature of time and technology, but this movie reminds us that there are generations growing old today with technology they couldn’t imagine and children, and so shall we probably all. Looking at near futurism through the perspective of an elderly protagonist is a fascinating twist. And there’s the two word phrase I wanted to focus on with this review. Not “fascinating twist,” “near futurism.” This is science fiction set next year. Not specifically 2014, but at a time where technology has made a few steps but not yet any great leaps. On current television the best expression of near futurism is Person of Interest. It’s set “today” with just a little bit of magic tech thrown in, but magic tech that feels fully plausible. In days gone by the best expression was the Mystery Science Theater theme song placing the show “next Sunday, AD.” That’s as good a definition of near futurism as any. So in the next Sunday, AD of Robot & Frank the primary bit of new tech are robot assistants. Mr. Darcy at the closing library. Frank’s robot “Robot.” They’ve clearly moved just beyond being toys, but haven’t reached a full saturation. There are moral questions surrounding these robots, what they represent, whether it’s fair to enslave them. These all happen on the outskirts of the story, and primarily through Liv Tyler’s character, but they deepen the world by hinting at broad debates that don’t apply to the central plot. It’s good to know the questions are being asked, but it’s not necessary to hash them all out on-screen. There are other little expressions of advanced technology. James Marsden’s skinny one seat wide car (based on a concept vehicle dating back to 2009). Video phones channeled through the television (already offered in some areas). See-through cell phones. All just little tweaks in the world we live in, none out of place as potential advances of the next five years. The biggest leap is in the robotics. Even then, the closing credits of the movie shows the current state of the art in domestic robots. These shots are footnotes to everything Robot can do in the movie, consolidated into a single machine. So let’s briefly compare the subtle future of Robot & Frank with another movie that may happen the same year. Robot & Frank makes no actual claims, but let’s say this technology could exist within six years. That’s probably optimistic on the robotics, but I’m choosing it as a handy date because 2019 places it in the same year as Blade Runner. With the two movies we have potential views of the same year, but imagined nearly 30 years apart from each other. One is set in the near future and one in a much more hypothetical and, at the time, distant future. If you want a difference between near futurism and more distance futurism, there it is. In one 2019 there are cell phones and helper robots. In another there are wars happening in deep space and earth is partially inhabited by almost indistinguishable robots. One of the real strengths of Robot & Frank is this handling of the near future. It’s hiding around the corners of the movie in very subtle ways. Slight changes to fashion. Slight changes to technology. And, most important, slight abstractions from current trends. This is the best tool for handling the near future, and why a prospective author of near future needs to pay attention to where the state of the art is, where technology is going, and where controversies lie. These are where story details thrive. It’s not about being “right” about the future, it’s about using the abstraction to make a commentary. Are we ever going to have assistants quite like Robot? Perhaps not. Is it possible we’ll see a new round of robot labor issues? It is. Could the digitization of books lead to the closing of libraries? It already has, just not quite in the way depicted in the movie. The near future is tough. Some writers may feel a pressure to be prescient, may feel that they’ll be held to their predictions. Some may be worried that the story could quickly be dated. I can’t say how well Robot & Frank will hold up as we slip into, then past the future predicted. The point may not even be for it to hold up, but for it to be a product of a moment of time. And, in this moment of time, it’s a very effective little story. I’m not Catholic. Let’s just start right out with that, because it’s the most common reason to be fascinated by the transfer of power to the new Pope yesterday. Yet I was fascinated, riveted to the coverage for the hour between the rising of the smoke and the emergence of Pope Francis. I find many aspects of the Papacy fascinating. Don’t get me wrong, I find many aspects of it troubling as well, but for one hour yesterday the fascination held sway. It’s because I love pre-Renaissance history. And names. And titles. And the history of names and titles. And really really long standing precedents. Let’s play this out. The Pope is the Bishop of Rome. That’s his actual title. There’s a whole story behind how the Roman bishopric earned its primacy over, say, the Bishop of Alexandria which gets into ecumenical history that I don’t understand. Beneath that title lies the unofficial title Pontifex Maximus, a Latin phrase that means greatest bridge builder. This is the title I find fascinating, as it predates the papacy. Indeed, it predates Christianity by about 750 years, as the first recorded holder of the title dates to 712 BC. The title applied originally to the high priest of Rome. In the 60s BC this changed when an ambition young man named Gaius saw it as a stepping stone towards greater power. No one had ever tried that, but no one else was Julius Caesar. He passed the title on to his heir, and for nearly 400 years the title was one of those held by the Roman Emperor before applying to the Bishop of Rome. There it is. Yesterday Cardinal Bergoglio accepted an elevation that includes a title with nearly 3000 years of history that was once held by Julius Caesar. Even if that title is largely unofficial, it’s one of the oldest titles held by any person today on the planet. He also got a new name. Popes choose a papal name, and they usually choose one with a history or meaning behind it. Cardinal Bergoglio chose meaning, but not history. The last pope to be the first of his name was John Paul I, though that doesn’t entirely count as he combined the names of his two immediate predecessors, John XXIII and Paul VI. One difference between John Paul I choosing an unused name and Francis? It’s that ‘I’. Typically that little “the First” is added retrospectively after there is a “the Second,” but John Paul I was John Paul I during his life. Francis will, at least it appears thus far, be Francis, not to be styled Francis I until a later Pope chooses to be Francis II. Before John Paul I, the last Pope to be the first of his name? Pope Lando. Seriously. There was a Pope Lando. He served in an era where Popes used their birth names, and he had the birth name of Lando. He also served from 913-914. When compared to a 3000 year old title, a merely 1100 year old tradition sounds almost new and quaint, but it still stands that Francis is the first pope to choose a completely unique papal name in eleven centuries. Eleven centuries minus 4-5 months. Sadly, Lando also served in a period where the Papacy was under the thrall of the secular politics of Rome, a period the church doesn’t remember fondly. This means we shouldn’t ever expect a Pope Lando II. Now we have a title that dates back 3000 years taken by a man who overlooked 1100 years of tradition while following in the footsteps of a man who was the first Pope to resign in 600 years. A man who then got to choose his own title because the precedence for a living ex-Pope is nearly non-existent. Titles of former office holders is another fascination of mine, though one that’s hard to exercise. In the United States, tradition states that an official is referred to by the highest governmental title received, even if no longer serving in that office. Thus we still speak of President Clinton, the two President Bushes, Governor Schwarzenegger, and so on. Along this line I’ve always wondered what title Taft would prefer to now be known as. He served at the top of two branches of government, first as President then as Supreme Court Justice. Indications are he took more pride in the latter, so I always feel he should be Chief Justice Taft, not President Taft. Benedict XVI chose “Pope Emeritus” which, okay, I guess. It’s not thrilling, but then the much better title “Antipope” is reserved for far different circumstances. Alright, enough about titles and names. One more bit of the papacy fascinates me. The power of the Bishop of Rome rose as the Western Empire collapsed. If you’re Edward Gibbon, this is not a coincidence. The death of Rome in many ways caused the birth of feudalism. Or, perhaps, the birth of feudalism caused the death of the Western Empire. It’s tough to really assign causation during those chaotic last centuries. Feudalism rose and fell. Monarchies held on in several European countries, and wherever there is a king or queen there is one last trace of feudalism, at least by name. The Pope is a monarch. It’s another one of those duties, he’s the monarch of the Papal See, and is the only elected monarch left in Europe. One of the delays between the smoke and the appearance, along with prayers and some personal time, is a ceremony of the Cardinals affirming their fealty to the newly selected Pope. It’s ceremonial now, but this is a little throwback to a period not just when it wasn’t quite such a given and to the old feudal oath taking practices, which themselves have root in the annual tradition of Roman troops repledging their loyalty to the Emperor. That’s all trappings. And it’s the trappings I find fascinating. I find the position troubling. Perhaps because it’s one man who exerts more power of influencing opinions than perhaps anyone else on the planet. Even if I agreed with those opinions, and many I do not, I would find that troubling. I understand that even most Catholics don’t fall in lock step with these opinions. But those that do, those organizations that do, those politicians that do, they can then exert a lot of power over others. We see that with organizations using Catholic theology as an opposition to health care reforms. And so I also track the changes in the Pope because I know that an increased liberality from these organizations will have to start from the top down. And that’s the dark underside of it all. There’s the fun, the stuff on television, the pomp, the ceremony, that expectation after the smoke, and that’s all a hell of a lot of fun. Now today there’s a new man, and there’s his positions. The Pope, man. It’s a fascinating job, and it’s a troubling position. Nominations for the 2013 Hugo Awards have closed, and over on the official Hugo blog a new post announces, “The final ballot for the 2013 Hugo Awards is scheduled to be announced on Saturday, March 30.” This means we’ll know what books we’re reading between April and August with little lead time. This is actually good news. I expected to learn with no lead time as nominations were announced April 7th last year and April 24th the year before. That’s the danger of setting up an event like the Read with complete reliance on a schedule that I have zero influence over. Initially I was planning to schedule the physically shortest book for April, expecting to have less reading time that month, with the other books assigned in alphabetical order by author. Since that’s not necessary, I’ll instead look at which books are part of a larger series and may require some pre-reading and which books are stand alone novels or part one of a new series. Books requiring pre-reading will be scheduled for later months, other books will still be sorted in author name order. And if there are more than five nominees, as has happened in 2010? I’ll pair up the two shortest books into one month with no secondary reads that month. I understand that those who are joining the read are more likely to have read the nominees recently, since they’re less than a year old by definition. I can promise I’ve read none of them, as the only 2012 Science Fiction book I own is Redshirts, and I haven’t yet touched it. Thus the schedule for these months will be more of a suggested schedule for those who have read none of them. If you’ve already read one or two, that’s great, especially in the off-chance of more than five nominees. In those cases, feel free to figure out your own schedule, and we’ll convene near the end of August to talk our opinions of who should win, or how you voted if you’re so eligible. One more thing as long as I’m talking administration the Read. It’s folly to predict nominations. It’s even more folly to predict nominations of books that haven’t even been published yet. Or scheduled. Or finished. But here goes even more folly. 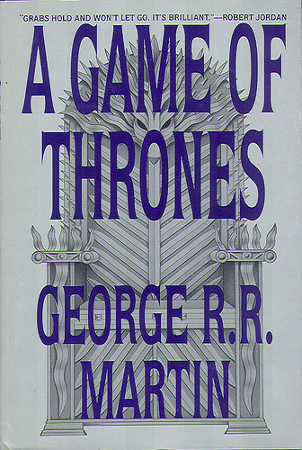 Books three, four, and five of George R. R. Martin’s massively epic Song of Ice and Fire series were all Hugo nominated. I don’t want to be in a position in a few years of The Winds of Winter being nominated and having to fit in the first five books, totaling around 5000 paperback pages into four months of secondary reads. Therefore I’m going to make two assumptions. Assumption one: The Winds of Winter will be nominated whenever it comes out. Assumption two: it won’t be out this year, thus making it eligible no earlier than 2015 and more likely 2016 or even later. Under those assumptions, I’m going to seed the first five books into secondary read slots where I can, trying not to stack them too tightly. Now my only terror is A Memory of Light being nominated next year and what the hell to do about 13 previous Wheel of Time books. Man, that would be a great name for a thriller novel. A young protagonist caught in a web of confusing lies, not knowing the way out, before realizing that she’s been duped by a major corporation she trusted. And being told “that’s just the way it is.” Can she fight back against such an overwhelming force? This is one of those awkward posts to write, because the first thing I have to do is acknowledge that I’m following other posts, largely written by departing SFWA president John Scalzi. And then I’m going to link to a lot of those posts. And then I’m going to quote a lot of those posts. I can’t imagine anyone reads this blog who isn’t aware of Whatever, who perhaps hasn’t followed this issue. But it’s something that I do want to bring up, because it’s something that I do want to talk about. Why are you launching these imprints? As publishing continues to evolve, and with more authors finding their first home in digital, we are committed to creating new ways for readers to discover books. The dedicated team understands both the content and medium, and wants to help break out authors in the digital space. The imprints will seek out the best and brightest to grow the next generation of authors in the most prolific and lively genres. A digital-only imprint of the lively genres of science-fiction and fantasy (Hydra), thrillers (Alibi), “new adult” (Flirt), and romance (Loveswept). This isn’t the first time one of the Big Six publishers has flirted with a digital-only imprint, and it’s likely not the last. This is, however, the first one that has seen the full fury of Scalzi and the SFWA brought down on it, which happened earlier this week when contract terms leaked first to Writer Beware, then were dissected on Whatever. The high-level overview? The costs of book setup, which are not inconsequential, are deducted from the author’s share of profits. All rights are conveyed in the contract, primary, secondary, all languages, all formats, everything. The term of the contract is length of copyright. What all that ends up meaning is that for no up front money the Hydra imprint gets full rights to do anything with the novel they see fit, and deduct the costs of those activities from the author’s share of the profits. At that point in the story the information was second-hand, but first-hand information soon showed up. Scalzi got his hands on an Alibi contract, and tore it to absolute pieces. Figurative pieces. Though I suppose it’s possible he printed a copy and tore that to literal pieces. I probably would have. The breakdown above held in this contract. These terms border on vanity press terms. Hell, at least most vanity presses don’t require length of copyright exclusivity. You extol your business model as “different”; the more accurate description, we believe, is “exploitative.” We are particularly disappointed to see it arising out of Random House, a well-regarded, long-standing publishing firm. Bluntly put, Random House should know better. SFWA has declined to recognize Hydra or Alibi as qualifying markets for membership, citing the lack of advance and the financial burden placed on the author. I’m thrilled that SFWA is all over this. I’m thrilled Writing Excuses is all over this. I’m thrilled that Scalzi is all over this. The danger of this contract, of these terms, lies in their success. If these new contracts succeed, they could serve as a blueprint for other publishers. There shouldn’t be a point where a publisher can say “this is how publishing is now.” Or “this is how the business works.” Because it’s not. And it shouldn’t be. Success of these terms relies on the ignorance of those who would sign onto them. Folks: @sfwa is doing what it can re: Random House/Hydra, but it can’t do it all. Tell writers you know to watch out and tell RH to STOP. There is no such thing as a voice too small in this matter, or a site too inconsequential. If anyone has any notion of publishing and sees this post who didn’t see the posts on Writer Beware, Whatever, or SFWA’s website then I’m glad to pass that information along. Even if that’s not possibly the case, I think it’s important for someone in my position to say something. That’s the second reason: Because I’m the potential target of this. I’m the writer working on his first few novels, the writer who has only seen short story contracts before, the writer who potentially doesn’t know the difference between good and bad terms, the writer who thinks maybe this is just how things work now, or will in the future, then signs on the bottom line. I feel targeted by this. Certainly not personally, but by a broader inclusion within a class of unpublished. And that pisses me off. I’d like to close with a few words of thanks. Thanks to Writer Beware and Whatever for both exposing that this contract, and more specifically for breaking down step-by-step just why it’s such a bad contract. Seriously, if you don’t want to read the posts behind all of my links, the most important one for someone who hasn’t seen a contract before is Scalzi’s breakdown of the Alibi contract. I’ll even relink it right here so you don’t have to scroll back up and figure out which one that is. I’m glad to have people looking out for me. Once again, certainly not personally, but by the same broader inclusion. It reminds me that everyone, no matter how successful, was once that aspiring writer trying to sell his or her first novel. Was once a potential target of a company trying to pass along bad contract terms. It’s why organizations like SFWA exist, and it’s why I look forward to the day I can pay into their dues. So be smart, go read, and be careful about what you sign.